Punt return units typically employ one of two general strategies – devote resources to an all-out block, or set up for a return. Facing the New York Giants in Week 10, the New England Patriots appeared to be bringing pressure on the Giants punt unit. 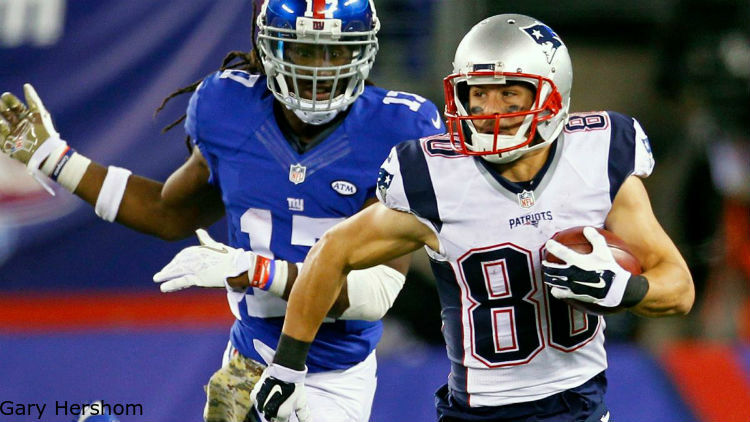 But, as Chuck Zodda shows us, returner Danny Amendola wasn’t content to lay down and give New York the field position edge. New England sets up with eight men on the line of scrimmage, a clear indication that pressure is coming. 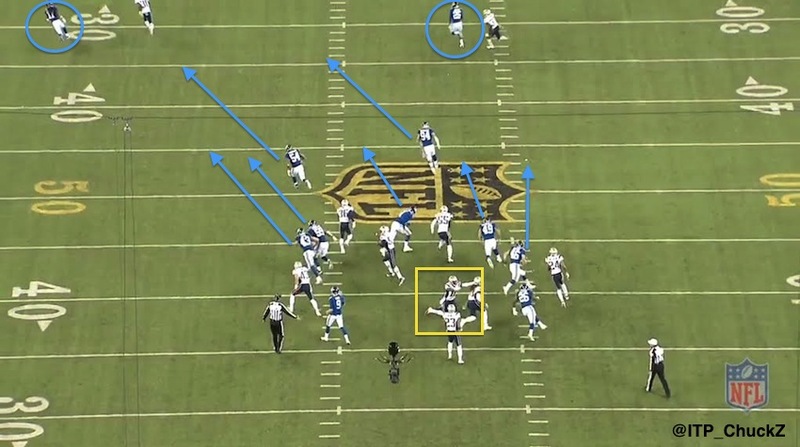 In particular, Matthew Slater (#18, right side) tends to signal the intent of many Patriots special teams plays, as he is often deployed at the focal point of an attack. Dwayne Harris (#17, blue box) has no one within ten yards of him, which could result in an audible by the punt team to a direct snap to the personal protector Craig Dahl (#43) and a pass to the flat to Harris. 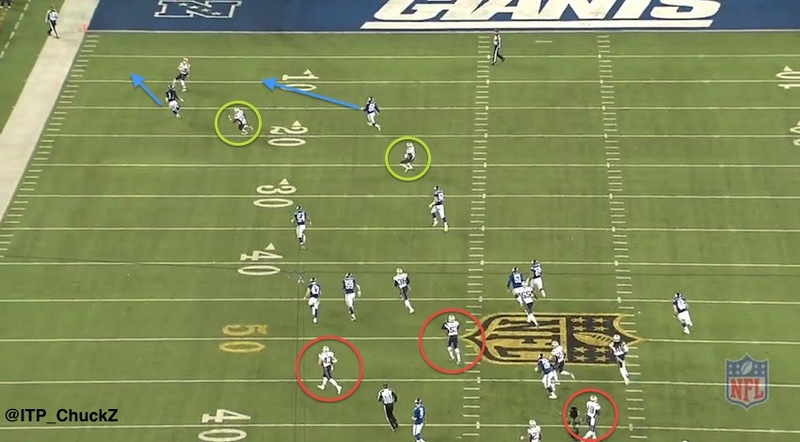 The Giants communicate pre-snap, but do not audible into this play. 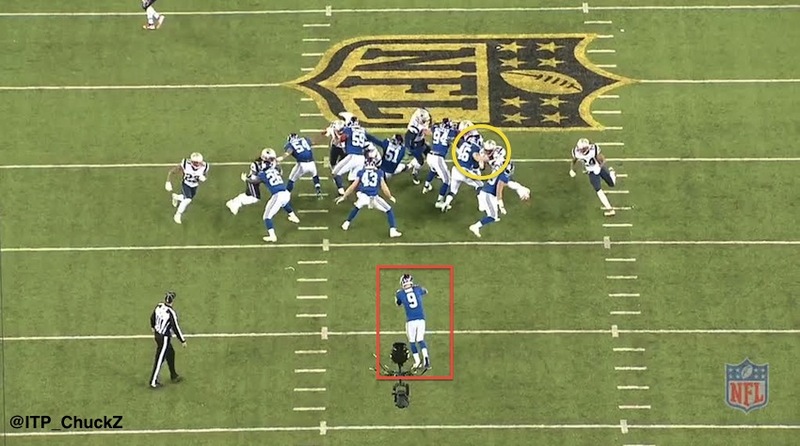 James Morris (#46) is engaged on the man to his inside, but reaches out with his right arm (yellow circle) and locks it around Slater’s shoulders and neck, in what could be called a hold, but is seldom flagged on punts. Wing has the ball after a clean snap and is one step into his approach. Slater (yellow box), who typically is the first man downfield in blocking, has turned to the referee and is complaining about the hold. 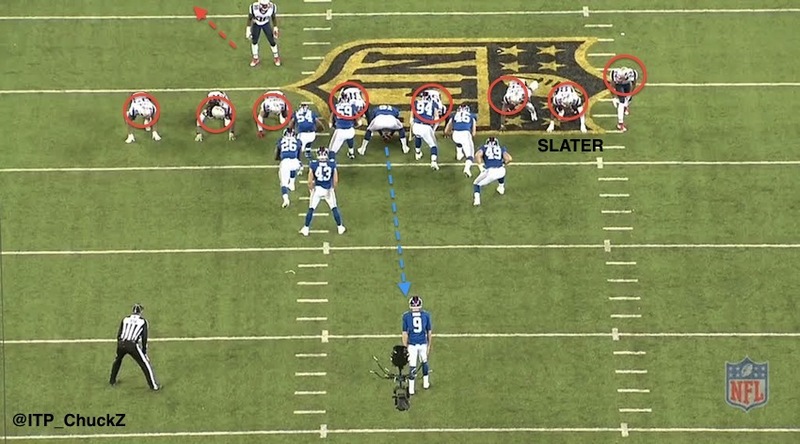 While there is clear video evidence this occurred, if Slater had any other responsibilities, his personality is one to typically deal with it after the play instead of between the whistles. His behavior here shows that there is essentially no expectation from the Patriots that there will be any further significant action. 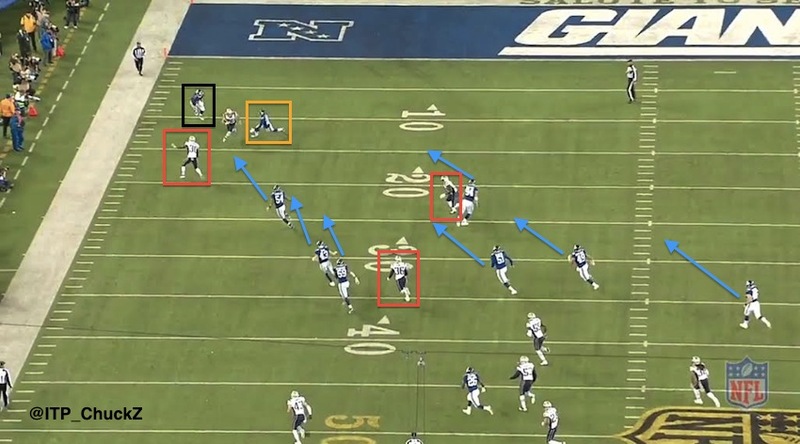 Meanwhile, the New York gunners (blue circles) are already 25 yards downfield, with the rest of their coverage team on the way. According to Bill Belichick, Amendola faked a “Peter” call, which is typically used on a short punt to keep the return team away from the area and clear of a potentially bouncing ball. 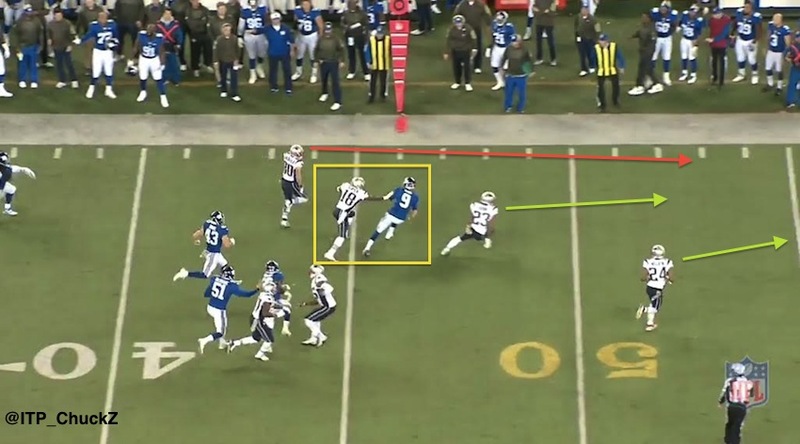 Circled in green, two Patriots have their heads facing Amendola, and are pulling up and moving away from him. 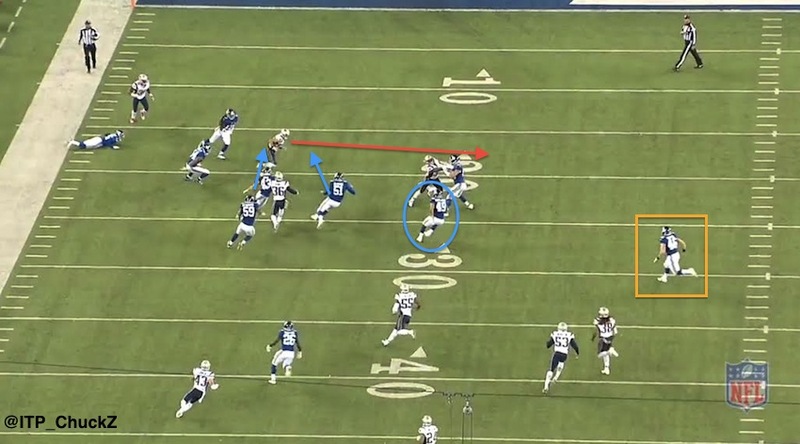 Harris continues to fly down the left side of the field, as he has not been touched, but he pulls up to the outside, likely because of the call by Amendola. Otherwise, his responsibility is to stay heads-up on the returner, or in the worst-case scenario, force him to the near sideline where he can use the boundary as a defender. 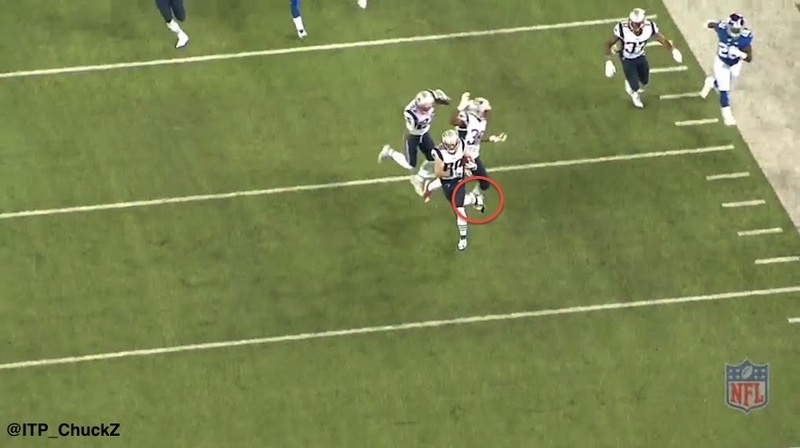 There is no benefit to him going wide and allowing Amendola back into space. Back near mid-field, three Patriots show no sign of significant movement back to block, with two players, one being Slater, adjusting helmets and a third jogging back toward the left numbers. 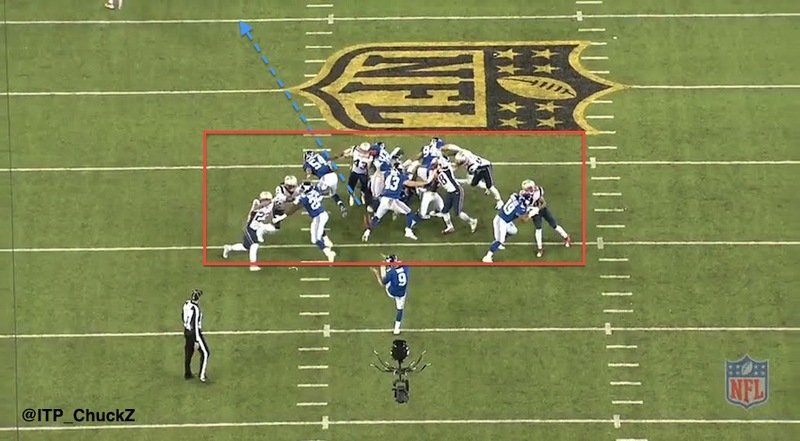 There are two critical errors by the New York coverage team here that allow Amendola to get outside: The first is from Nikita Whitlock (#49, blue circle), who instead of maintaining his coverage lane just inside the numbers, gets stacked up on top of Mark Herzlich (#94). Just inside of him, long-snapper Zak DeOssie (#51) has already filled that hole, so Whitlock is out of position. 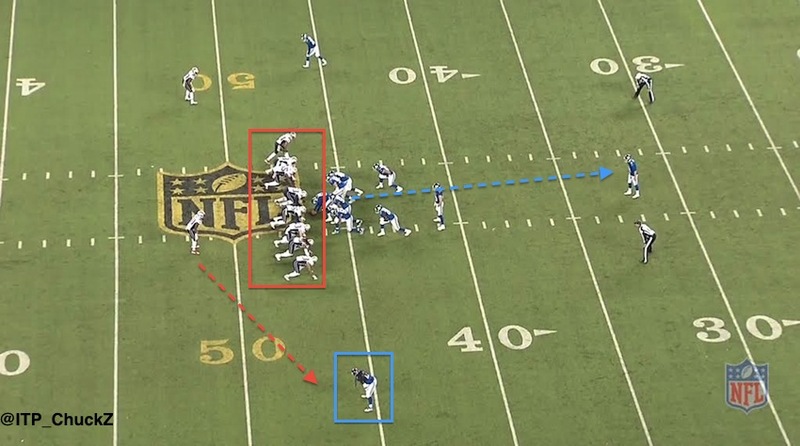 He should be wider to leverage Amendola back to the left side of the frame. 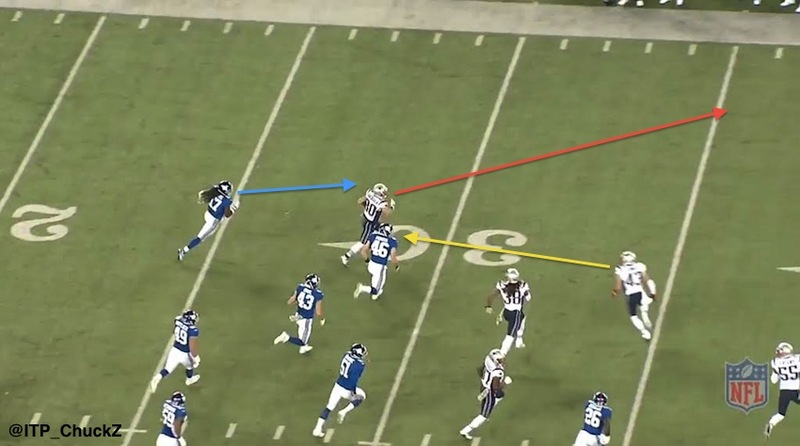 Circled in red, Harmon and Amendola get their feet tangled at the 12-yard line, sending an exhausted Amendola into a heap where he is eventually tackled at the Giants 7-yard line. 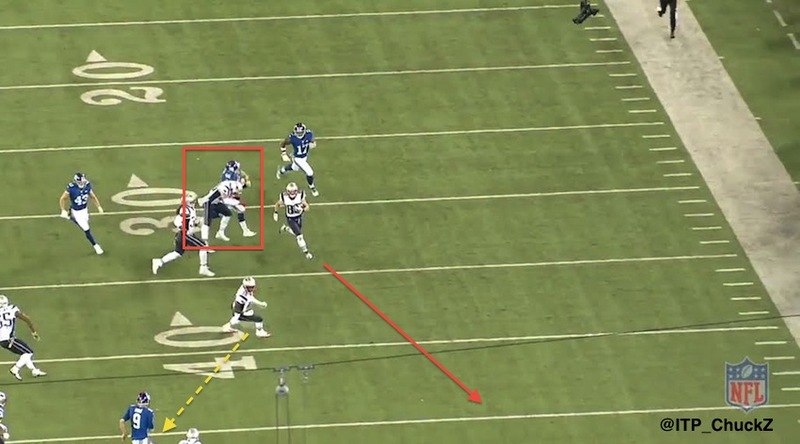 Although the Patriots did not score on this play, they punched it in with a LeGarrette Blount touchdown three plays later, making the score 20-17 and getting back in a game that was slipping away from them. 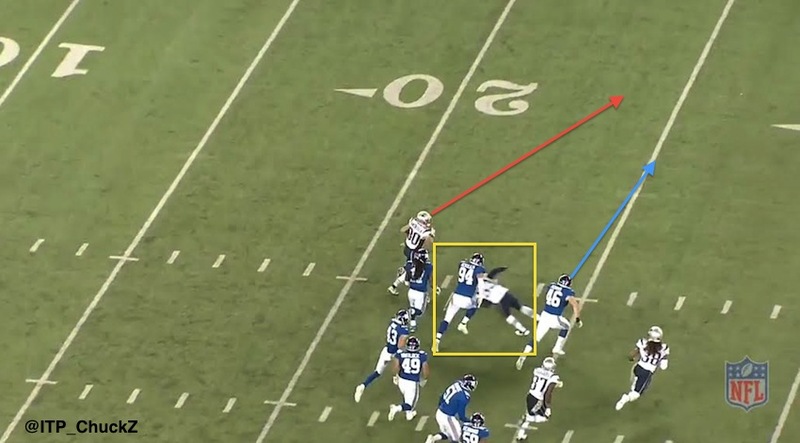 While this play was clearly designed to block the New York punt, Amendola’s smarts and poor coverage by several Giants allowed the Patriots to give a strong counterpunch at a critical moment in the game. Thanks for the sharp analysis — catching Slater arguing is a genius indicator.